If the city was alive, what would it look like right now? In a city undergoing transformation ahead of the Tokyo Olympic and Paralympic Games, trucks carrying the required goods and materials will be one symbol of Tokyo over the next five years. 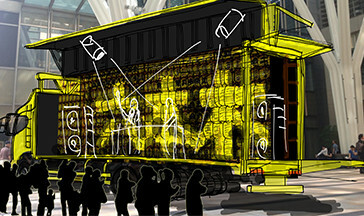 The Rhizomatiks team, lead by media art director Seiichi Saito, will give these working vehicles personalities and new innards in a large-scale art project that involves communication between trucks and crowds at Roppongi Art Night. One of these trucks, dubbed “Akebono” (Dawn) will carry giant mirror balls and be based at the Roppongi Hills arena, appearing at various venues such as The National Art Center, Tokyo and Tokyo Midtown during the RAN core hours, while the other, “Hal” (Spring) carrying an array consisting of paper lanterns will park up at Tokyo Midtown, connecting with the audience by at times giving glimpses of emotion, and at others, trading special tricks with the audience. 巨大ミラーボールを搭載して六本木の街を移動するアートトラック「アケボノ号」。光るジャングルジム基地と融合した近未来的演出も、メディアアートとパフォーマンスのコラボレーションも、来場者の操作による演出もこなす、多彩なマシン。 The art truck “Akebono” driving around Roppongi streets carrying giant mirror balls will be a multi-talented piece of machinery presenting neo-futuristic performances incorporating its illuminated “jungle gym” scaffolding base, collaborative performances with media art, and effects controlled by visitors. アケボノ号始動！ライブwith HIFANA＋ゲスト Activation of Akebono Truck! Live with HIFANA and more. As a glittering finale to the core hour starting ceremony, “Akebono” will finally power up, fusing with its scaffolding struts in a stunning live performance! The art truck will entrust control of its massive form to participants. Join in operating mirror balls to create an art space. 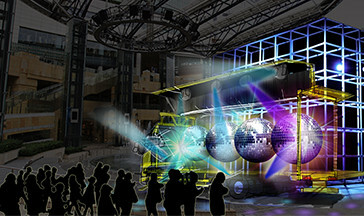 The art truck Akebono that returned to its base gives the control of mirror balls to the visitors and dominates the enormous screen which projects the streets and voices of Ropppongi. Gather in the Atrium to witness a late-night performance by “Akebono” and HIFANA through the glass! 「ハル号」は東京ミッドタウンに鎮座し、常に東京・六本木関するデータを収集。搭載した提灯に収集したデータをビジュアライズするとともに、内容に対す感情をあらわす。 また、来場者が投稿可能な特設サイトから、提灯に表示する。フレンドリーで気軽に写真撮影に応じる。 “Hal” is a working vehicle with a personality. Continually gathering data on Tokyo and Roppongi, and presenting it in visual form on the lantern display it transports around, the truck will also display its feelings about the content of that data. It will also input participants' feelings from a special site set up to receive comments, and display them on the array. “Hal” is also very happy to be photographed. The body of Hal Truck will come alive in a painting demonstration by topical artists MAHARO (GROUNDRIDDIM) and MON (DOPPEL / #BCTION) and will be painted with their own unique perspectives. A04 広域プログラムArea-Wide Programs スペシャルトーク「都市× アート× テクノロジー: 東京の未来を考える」 Special Talk "Future City, Future Tokyo - City, Art and Technology"
A special talk event by Seiichi Saito, a game creator Tetsuya Mizuguchi, Clare Reddington of Watershed UK and Ben Parker & Sam Hill of PAN Studio as the partners of “Hello Lamp Post Tokyo” for Roppongi Art Night.